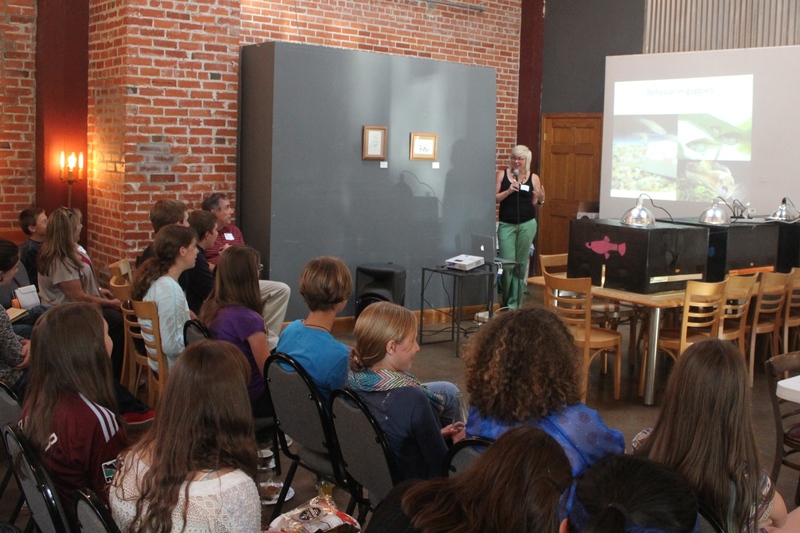 Dr. Lisa Angeloni and I were invited to be the guest scientists at September’s (2014) Front Range Teen Science Cafe! The monthly event is organized through the CSU Atmospheric Science Department, spearheaded by Melissa Burt, and hosted by Everyday Joe’s Coffee House. We set up a station where participants could observe and record guppy behavior, especially mating behavior, and a station where teens sketched color patterns of male guppies. They compared guppies from three different environments and discussed the different selective forces that have shaped the populations, resulting in the phenotypes that they observed. The well-attended event was a big success and we hope we’ll be invited back! Here are some event photos from the Teen Science Cafe website and others from my website taken by Elliot Broder.